No matter what I do, I cannot quit on Target for my shopping needs, but especially for the items I do not even need. There is something so attractive about that giant red target logo that just screams, “come on in!” every time I drive by the store. Once I got in the habit of regularly shopping at the discounted retail store, I realized that maybe it would be in my best interest to look into coupons, that’s when a friend told me about the Cartwheel app. 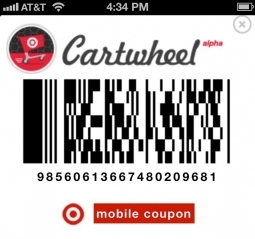 Cartwheel is an app that keeps track of weekly specials and coupon deals that are displayed to Target.com account users. According to Target’s website, you can sign up through email or your Facebook account and you will need a smartphone to redeem savings in stores although you can bring a printed barcode with you in lieu of a smartphone. Target has partnered with Facebook in hopes that you will spread the word on these deals through Facebook. Each time you select a Cartwheel offer, it appears on the Facebook newsfeed so other friends can see it. You do have the option to adjust your privacy settings if you do not wish to show this information. The app then allows users to see all coupons offered in all sections of the store, broken down into category. It allows you to choose up to 11 items that offer a coupon barcode to add into your Cartwheel. Once you are satisfied with what you are buying, or have reached 11 items, you make a Cartwheel that creates one barcode containing the codes for each individual item in one. You can use this app’s website version or, as I prefer to do, use it from your mobile device while shopping through the store at the same time. It makes my life paperless and simplified. The one issue I have found personally is that my local Target is a dead zone for Verizon customers somehow. Every time I shop in that particular store, I can never get a call or text out, let alone get my Internet to work properly. This obviously causes issues when I want to add last minute items into my Cartwheel to achieve discounts at check out. In order to keep ahead with emerging media, I do think that my local Target needs to adjust this problem, should it continue to cause disturbances to their customer’s shopping experience. Does anyone else think that in a few more years it will be impossible to be anywhere that doesn’t offer good cell phone service? There is definitely something comforting about waking into a Target store and knowing you’ll find everything you need. Great brand affinity. I love that they’ve made life even simpler for customers by enabling them to combine multiple discounts into one simple code. Who wants to be that person with a fistful of coupons holding up the checkout line? I need to tell my coupon queen/Target maven sister about this one, stat! I highly recommend it! Not only is it a fascinating tool from a media perspective, but it really is helpful. I’ve saved $5-15 on a purchase from stockpiling coupons on that app. I do suggest that if your Target is a dead zone for reception that you set up your coupons before going into the store, rather than all at once. Oh. My. I cannot begin to explain the joy Target gives me. Discovering Cartwheel has been mind blowing and so helpful to save even more!!! I’m so glad to hear that! nataliecorkos on Tinder: Clever or Creepy?